On September 6, it’s time to join editors, stars, models, fashionistas, and designers for Fashion’s Night Out, “as they flood stores in cities across the country and around the world for fashion’s most iconic extravaganza”. For the fourth annual FNO, forty percent of the proceeds raised from the sale of the official FNO collection will benefit the New York City AIDS Fund in the New York Community Trust. 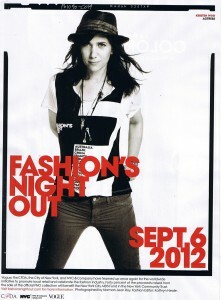 Kristen Wiig’s supporting this cause, and to promote the event she’s featured on a print ad, as can be seen to the left. Big thanks to the fantastic tumblr user kristenwiigdaily (go there to see the picture in full size) for the find! Read more about the event at FashionsNightOut.com! KristenWiig.org The definitive Kristen Wiig fansite since 2012.